Inspired by the fast paced culinary competition show, Chopped cookware allows you to prepare a meal with confidence, agility and time to spare. 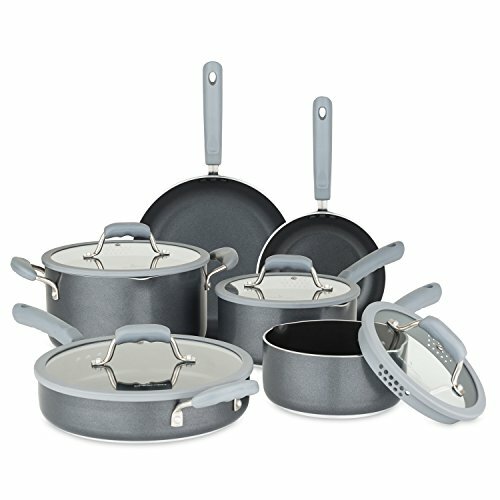 The Chopped 10 piece aluminum cookware set is built to withstand many everyday cooking challenges. The set reduces straining time with built in silicone straining lids and dual handed pour spouts. The silicone rims on the lids grip the pan providing a firm fit and feature two different sized strainer holes that work with the built in spouts, to allow you to save time and strain directly from the pan. The dual sided pour spouts on the sauce pans and stock pots are designed to work with both a right and left handed grip to assure Comfort. The pour spouts themselves can be used with or without the straining lid and eliminate drips down the side of the pan when pouring. As an added benefit, the vented glass lids with silicone rims hold moisture for more flavorful cooking while reducing the opportunity for boil-overs. The set is constructed to give ultimate cooking performance with three Millimeter heavy gauge aluminum to minimize hot spots by distributing heat evenly throughout the pan. Works on all cooking surfaces including induction and is dishwasher safe. The stay cool ergonomic handles give you the agility to move the pan quickly on and off the stove. The set includes 2 and 3 quart sauce pans with lids, 3 quart saute pan with lid, 6 quart Dutch oven with lid, and 8 and 10 inch fry pans. Drip free dual sided pour spouts for right or left handed use; dishwasher safe. If you have any questions about this product by Chopped, contact us by completing and submitting the form below. If you are looking for a specif part number, please include it with your message.